Ah, mes amis, you want to share your love of Family Estate Champagnes with your friends… Bravo! Champagne comes in a variety of flavors, qualities and intensities. It stimulates your palate, demanding to be noticed and appreciated, like the overture in a symphony, reoccurring amidst a theme. Gone are the days of uncorking your bottle for a celebration or party. But first you must expand your palate in the only way one can: experience. 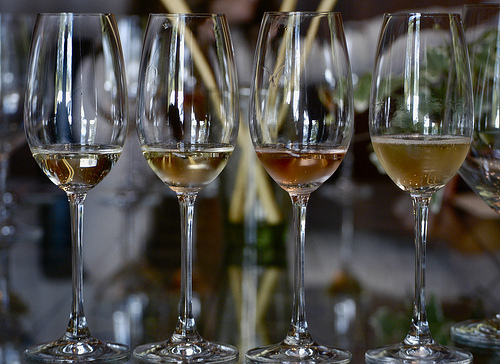 This summer, shake up your season by hosting a champagne tasting party by using these tips. Contrary to popular belief, the flute is a poor vessel for Champagne. The narrow surface doesn’t allow for the expression of the wonderful aromas. Martini-style “coupes” aren’t suited either. For the perfect bubbly, use tulip-shaped glassware that is wider at the base and narrow at the top. These glasses keep the aroma inside to please your nose, but give the Champagne room to express itself. 2. Focus on your palate. You must carefully consider each sip with all of your attention. When you attend the theatre or opera, you silence your phone and remain silent. When you converse with a friend, you listen closely and undistracted. Likewise, concentrate when tasting Champagne without any interruptions. 3. Engage your group of friends. Champagne is a wonderful shared experience. When you sip your bubbly, challenge your friends and guests and come up with words or feelings that mimic the flavors on your tongue. Is it exciting, or perhaps charming? Does it bring forth any memories? Many mistake Champagne for a delicate flower, easily ruined by clumsy fingers. This is not true! When you take your first taste, fill your mouth and hold it for several seconds. In order to capture the sophistication and detail, you need to experience a healthy mouthful. Many of Champagne’s aromas can be masked by serving it too cold. Your mouth, tongue, and throat can only accept so much sensation. Remove your bottle from your cooler (which should be set no higher than 50 degrees), open and pour, but allow it to sit in your glass for ten minutes before drinking. 6. Half a glass, please. A full glass permits the Champagne’s rich (and essential!) aromas to dissipate quickly. A nearly empty glass doesn’t let the bubbles form and rise pleasantly. Fill your glass halfway for an exceptional experience. First, admire the bubbles and color. Champagne should be bright. Younger Champagnes should be nearly colorless, while the older should be golden. Swirl the Champagne in your glass to mix it with the oxygen and inhale, taking note of the aromatic flavors of the fruit. When you sip, roll it across your tongue, examining the way it interacts with your taste buds. After swallowing, pause and contemplate the aftertaste on your palate. Quality Champagnes have a strong, long finish.